Jenoptik opens up new application in laser material processing. San Francisco, January 2012 - In the LINOS catalog from Qioptiq you will now find the new gold surface mirror for the infrared spectral range up to 25 μm. This mirror series is characterised by greatly improved resistance to environmental influences: abrasionproof, high reflection, climatically stable and highly adhesive. Round mirrors with diameters of 12.7 mm, 25 mm and 50 mm, and an elliptical mirror with principal axes 22.4 mm x 31.5 mm, can be delivered ex-works at attractive prices. 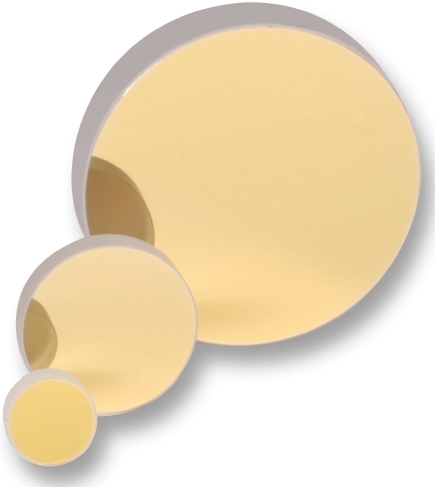 The gold layer on these mirrors is protected by a newly-developed dielectric coating. This ensures that the mirrors are scratchproof pursuant to MIL-M-13508C 4.4.5. Resistant to solvents pursuant to MILF48616, 4.6.9.2 they are easier to clean and are also resistant to moist heat (MIL-C-48497, 4.4.6). Nevertheless, they guarantee a high degree of reflectivity in the IR spectral region over a wide angle of incidence range without absorption band: average value of the reflection Raverage >98% over 2 μm for an angle of incidence range of 0° ≤ AOI ≤ 60° (unpolarized).